Ecosystems are one of the largest untapped resources to our disposal. By designing and embedding smart ecosystems we can harvest valuable functional uses, increase the performance of buildings and cities, and design more inpsiring environments. Except develops custom ecosystems for use in urban landscapes, agriculture, buildings and industry. Can you 'design' an ecosystem? Yes, ecosystems can be designed to perform a wide variety of functions by combining the necessary ingredients and materials, and tuning them to their environment. When developed and integrated well, ecosystems can have large beneficial effects on all environments. Why use ecosystems for functions? There are various reasons why you'd want to use an ecosystem to perform functional tasks. The most important reason is that ecosystems always have a large set of positive side effects. Unlike a machine that performs a single function, ecosystems can deliver all their benefits at the same time, and the more they're tapped into, the better they can work. This way they can deliver more value on the whole than mechanical systems. Also, they look amazing, people are strongly attracted to them, and they generally tend to increase the quality of living environments. When designed well, ecosystems last longer, are more resilient and perform better than any other solution. How do you design an ecosystem? We design ecosystems by bringing together biologists, ecologists, engineers and designers. Together they research the specific qualities that are needed for the local climate and functional conditions. Yes, we hear you, a lot of people are beginning to understand the power of beneficial ecosystems for their business, home, industry and cities. If you want to start today, you can start small, for instance at home if you're the hands-on type with, for instance, a polyculture garden. If you're looking for something more substantial, we can develop ecosystems up to the scale of cities with you to fit your particulate need. Talk to us to find out how smart ecosystems may be a solution for you. Also take a look at Polydome, our custom high performence agriculture design system. This masterplan transforms downtown Shanghai into a fully sustainable community, in energy, food, water, and jobs, designed for Expo 2013. The plan strategically interweaves sustainable innovation with exciting urban design, and making it run with urban agriculture, sustainable technologies and vertical farms. 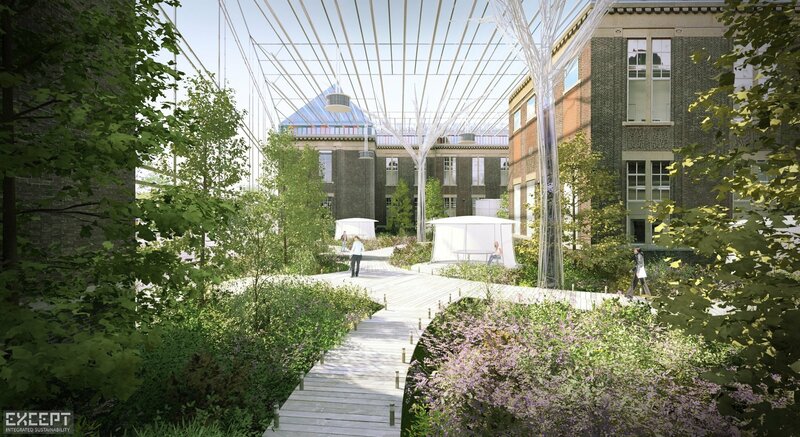 The result is a valuable and beautiful urban community, an emergent circular economy, and a future-proof investment. The Shanghai urban master plan demonstrates the Urban Renaissance approach on a specific site adjacent to Nanjing road, incorportating a historic Lilong housing district. We developed a sustainabile conversion and development plan for the post-war social housing area Schiebroek-Zuid in Rotterdam. The project provides a flexible and exemplary roadmap for converting the neighborhood into a self-sufficient and sustainable area. It applies innovative energy solutions, urban farming, social and economic programs, secondary currencies, and adaptive redevelopment strategies. This project was commissioned by housing corporation Vestia and agricultural research network InnovatieNetwerk. BKCity is a magnificent listed monument of more than 30.000m2 functioning as the faculty of Architecture of the TU Delft. Except created a phased plan to make this historic educational building energy and carbon neutral within ten years. 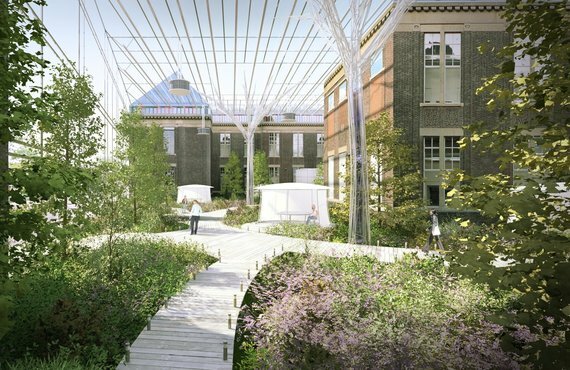 The plan converts the building into a didactic tool that puts sustainability at the heart of education for generations of architects, introducing a unique in-building ecosystem that provides an inspiring environment, functional qualities and cost savings. On the steep slope of one of the edges of Toronto’s ravine system we created a place for contemplation, introspection and shared spiritual expression. A place with no prescribed belief, where people of all walks of life can experience what is sacred to them in their own way. The project introduces a unique ecological approach to its site, significantly contributing to the ecosystem of Toronto’s ravine system. The Merredin Spirulina plant, developed in the year 2000, is one of the first projects in which we applied systems thinking and our holistic, systemic approach to innovation, using ecology as a main component. The result is a highly unusual but stunningly effective business case for a sustainable, ecological industry to revive a desert town in Australia. This project is a testament to the strength of holistic, systemic approaches. For this reason, we documented the project extensively on this page, indluing the conception process, business case and design of the plant. For more detail, feel free to contact us. The Portal to Venlo offers the greenhouse industry in the east of the Netherlands a model to develop a sustainable industry. 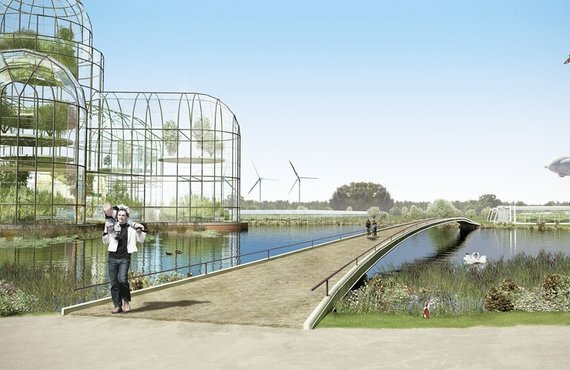 The project re-imagines an existing greenhouse industry area, currently fragmented, inefficient, dangerous for bicycle tourists that cross the area and in general rather unappealing. 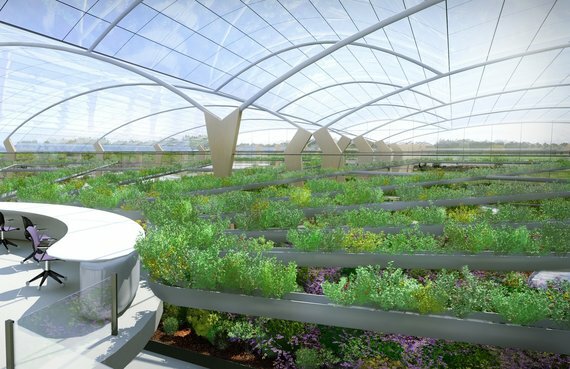 Will Estonia be the first proud owner of a Polydome sustainable agriculture system in the world? During the second half of 2015 we researched the feasibility of a Polydome in the Arkna Eco Park. Our study and supporting business plan were funded by Horizon 2020. For Staatsbosbeheer (the Dutch nature management agency), Flevoland Province, and the municipalities of Almere and Lelystad, we developed a vision document for the future development of Oostvaardersplassen National Park in the Netherlands. The document offers a vision, mission, performance goals, and principles for a national park that will be internationally acclaimed by 2030 for its ecological sustainability, societal value, and economic resilience. A accompanying Inspiration Booklet introduces interesting practices from around the world to offer inspiration and specific ideas for actions to realize the formulated perfromance goals. 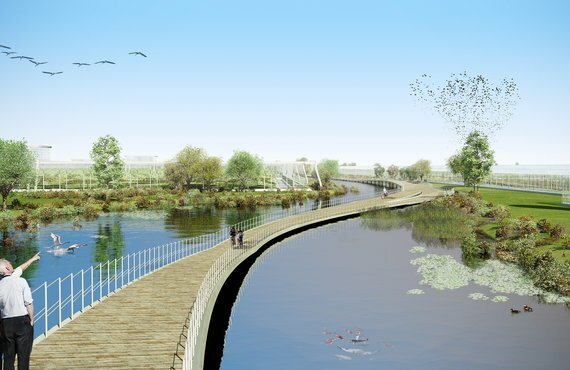 In Rakvere, Estonia, we developed the masterplan for the 671 Ha self-reliant Arkna Eco-Park. The park is built on a historical site tracing back to 1527, and becomes a primary tourist destination in the country, including a Polydome sustainable agriculture system. We worked with Arkna Eco-Park to build a complete masterplan template for years to come, including its marketing strategy, identity, logos and brochures, closed loop metabolism, food system, event program, and design guidelines. We’re working with Schiphol Real Estate and more than 70 stakeholders and experts on boosting sustainability and performance of the Schiphol Central Business District with the concept of a Catalytic multi-tennant office design. The project realizes an integrated sustainable and self sufficient area, that is a healthy and inspiring place to work, with a footprint of over 20.000 m2 in an unprecedented sustainable and future proof building.